Chicken enchiladas are one of the easiest and quickest dinners to prepare and cook. There are many variations in making them, but I find my recipe to be simple enough for the beginner and satisfyingly delicious for all. Let’s get cooking! Boil the chicken breasts, while you wait cut up the onion and garlic. Preheat the oven to 350 degrees, and lightly grease up a glass pyrex or oven safe large pan with butter. Open up the enchilada sauce cans. Once the chicken has boiled for 10-15 minutes turn the stove off and drain the water. Lightly oil a frying pan and set on low, while you cut up or shred the chicken. Once the pan is hot, toss in the onion and garlic. After 2-3 minutes add the cut up chicken. Season with black pepper, salt, red pepper flakes, oregano, parsley and hot sauce to your preferred taste. Add grated cheese on top and let it fry until chicken is fully cooked. 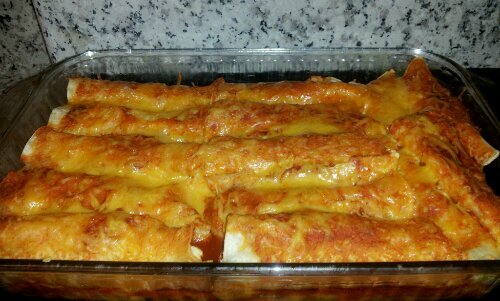 Â Drizzle sauce and grated cheese over rolled enchiladas. Place in oven and bake for 20 minutes. Â Once done, let sit outside of oven for about 10 minutes. Top with sour cream and avocados, and cook refried beans and rice to serve on the side. Enjoy your plate, and the yummy leftovers you’ll have for lunch the next day!